My husband always says "I don't live in Texas...I live in Austin". We feel relatively safe in a very liberal city, surrounded by a very "red" state. I feel for anyone that deals with hatred and intimidation in what should be their refuge. This is domestic terrorism with people's lives at stake. Let's hope the Lauderdale County Sheriff's department finds the terrorists and brings peace back into Matt and Dustin's lives. 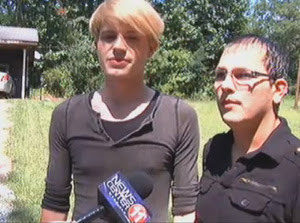 Mike Halterman, the editor of Out on the Town magazine, tips us off to this story about Dustin Tasso and Matt James, a Toomsuba, Mississippi couple who have been targeted in a series of attacks culminating in windows of their car being broken and the word "fags" being spray-painted on the street in front of their house. Someone came to our home, busted our window out of the back of my car," says Tasso, "our home was broken into, profanity was spray painted on the front of our driveway, and you know it's just a scary feeling for us." "We just felt like there needed to be something done," says James "because it's not just us this stuff happens everyday, and I mean it's not noticed or recognized and there's got to be some kind of justice."